Create a copy of your folio to save time creating similar docs. You can create a copy of any folio to use it as a starting point for your next project. On your dashboard view, hover over the folio card you want to make a copy of. 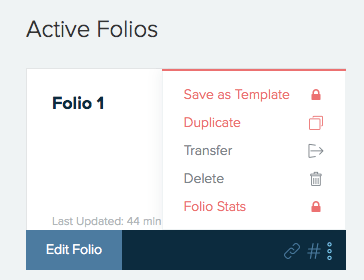 This will create a copy of the folio on your dashboard which you can open to edit and rename. Keep in mind that you won’t be able to duplicate folios if your account is on the Free plan since you will have a 1-folio limit. You can increase your folio limit and unlock other premium features by upgrading to any of our premium plans. Learn more about managing your folios on your dashboard here.